Posted on June 29, 2014	by chainsoff. This morning, the Islamic State of Iraq and Syria (ISIS, or ISIL if you must) announced it was pronouncing the reformation of the caliphate, with ISIS emir Abu Bakr al Baghdadi as caliph, and that it was renaming itself simply The Islamic State. The official announcement was released in Arabic, English, German, French and Russian. 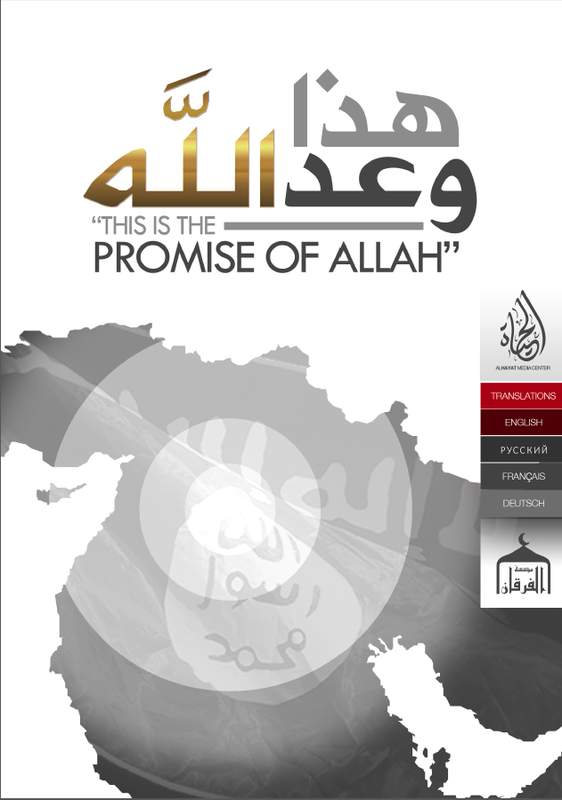 In the statement, ISIS claimed that it had fulfilled all the legal requirements for the caliphate and that all existing jihadi groups and indeed all Muslims around the world were religiously obligated to swear loyalty to the new Caliph Ibrahim (using the name provided by ISIS in the course of proving that Baghdadi has the required lineage for the title). Prior to this pronouncement, my assessment was that there was almost no way ISIS could exit June in worse shape than it entered the month, and that still holds, but July is beginning to look like an open question. ISIS, an al Qaeda breakaway group, had made a bold move to seize territory in Iraq that had resulted in tremendous gains in both equipment and money. Even if it lost all of the territory it gained in June, it would still retain many of those spoils, with new clout, status and physical assets to compete with the other jihadi groups operating in Syria and near the Iraq border. As I’ve discussed previously, ISIS has been competing with the original al Qaeda for leadership of the global jihadist movement (a great history of the conflict can be found here, by Aaron Zelin). The pronouncement of the caliphate is sure to be wildly controversial on religious grounds, but ultimately it could cut either way. The backlash may harden the pro-AQ segment of the global jihadist movement against ISIS, especially with the announcement’s flat out demand that all other jihadist groups are religiously obligated to pledge loyalty to ISIS. But it will also generate some enthusiasm from footsoldiers and different segments of the global movement that see ISIS as a rising star. There is a risk of high-level defections from AQ to ISIS, particularly in North Africa, where several groups and segments of groups have already broadly telegraphed their sympathies toward ISIS. A significant number of AQAP supporters in Yemen have also been showing signs of sympathies to ISIS for some time, and since the announcement, social networks in the neighborhood of AQAP appear to be supportive of the announcement. On the other hand, Muslims worldwide are likely to react negatively to the pronouncement on the whole. The question here is how many currently nonviolent radicals will jump toward ISIS and how many will jump away from it. Again, this is a high-risk, high-reward scenario for ISIS. It could reap considerable benefits, but the backlash could be severe. The long term outcome is unclear, but much may depend on what happens next in Iraq. More significantly, the calculus of holding territory has now changed. Prior to the pronouncement, ISIS could have fallen back to its previous domain along the border of Iraq and Syria with little loss of face and a huge increase in its warfighting capabilities, thanks to captured weaponry and millions of dollars worth in stolen funds. There is one factor that could cause all of this to work out dramatically in ISIS’s favor, but it would require an large number of variables to fall into place. That factor is U.S. intervention. The prospect of a U.S. military intervention, most likely in the form of air strikes, was already problematic. While there are many who understandably favor hitting ISIS in order to deny it control of territory in Iraq, such a strike would bestow on ISIS the one thing it has until now been unable to definitively claim — legitimacy. A potential new line of jihadist argument then emerges: The caliphate was restored, but it was directly destroyed by the United States. U.S. strikes could also subvert the trend toward the localization of jihadist conflicts in recent years or unite the currently splintered jihadist movement against the U.S. as its primary enemy once more, with ISIS subsequently holding a central position in a unified global struggle. If the United States is seen to be the most important contributor to destroying that nascent caliphate…. …there could be cascading consequences on a scale we have not previously seen. It could result in waves of terrorist attacks in the West, a surge in foreign fighter recruitment and fundraising, and significant instability in the remaining Middle Eastern states that aren’t already experiencing it. Above all else, it is clear that ISIS is an adrenaline addict. If the group survives, it may be emboldened to take even greater risks in the future, and our strategy needs to be informed by that understanding.